So there you go folks, one more reason not to drink and drive; those poles aren't cheap. Good news for Coeur d'Alene- the American Lung Association says the city has some of the cleanest air in the U.S. for amount of smog. But the Idaho Department of Environmental Quality doesn't necessarily agree, saying Coeur d'Alene -- and the Kootenai County airshed -- are edging closer to violating air quality standards. To give you some background, KMPO has been working with the state legislature to try to prevent vehicle emissions testing in Kootenai County. We feel that the ozone issue is not a threat at this time and there are other measures that can be taken rather than going to a punitive regulatory program. For example, a public information campaign on how to limit ozone emissions (such as not leaving your car idling)could cut down on pollution. There are also low cost measures that could be implemented at gas stations such as installing vapor recovery systems to eliminate a lot of the precursors to ozone. The Idaho House worked late last night, then attempted to adjourn Idaho’s second-longest legislative session– still without passing Gov. Butch Otter’s transportation funding plan. However, unless the Senate follows suit, the House will be forced back into session Monday. Here's a link if you want to check it out and see how they're doing. The Idaho Transportation Department this week introduced a new Web site that tracks the department's progress in addressing recent audits and Governor Butch Otter's executive order to document ongoing efficiencies. The site, called "Tracking our Progress," organizes ITD's reporting process into four areas: Accountability and action plans, Reports, Federal stimulus projects and other ITD projects, such as GARVEE projects, project planning and traveler information. Here's a link if you want to check it out and see how they're doing. Studded snow tires must be removed from motor vehicles in Idaho before Friday (May 1). The use of studded tires is legal in Idaho from Oct. 1 through April 30. The Idaho Transportation Department (ITD) is working on a number of projects that will improve US-95 through the Coeur d’Alene/Hayden corridor. I've been hearing a lot of questions about those projects. 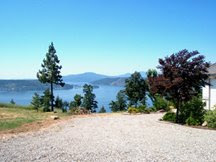 And the 'City of Coeur d'Alene Today' blog just happens to have some answers. Check it out here. I blogged a couple weeks ago about how some people are fighting back against cameras that either record red light runners or speeders. Well, it's no longer a joking matter, or just a case of vandalism in Arizona, where a photo-radar van operator was gunned down last week. Here's the story. The fight over Governor Otter's Transportation plan continues. House GOP leaders say they’ll adjourn for the session tomorrow without passing the plan. That likely will force the Senate to force the House back into session against its will as the Idaho Constitution states, “Neither house shall, without the concurrence of the other, adjourn for more than three days.” Here's more on this bizarre standoff. Where does all the sand go that is put on city streets to help traction in the winter? If you live in Seattle, it goes into the sewer. Where it's now causing all kinds of problems. This year's record amount of sand is shutting down pumps and requiring increased maintenance at King County's sewage treatment plant. Here's the story. Gas prices are definetely rising, but are we going to see them get as high as $4 again? AAA says that's not likely. Here are some questions and answers about gas and gas prices, from the Spokesman-Review. The Idaho Houses' Ways & Means Committee had an unscheduled meeting this morning to introduce a new bill to raise registration fees for heavy trucks. The 5% increase was originally proposed in the governor’s transportation initiative. The fiscal impact of this bill isn’t entirely clear yet, but may be in the range of $2.4 million. An editorial in the Spokesman-Review today lauds Governor Otter for having a backbone when it comes to getting a transportation bill passed. Otter vetoed 10 bills on Monday and 25 Tuesday in protest of the Legislature’s failure to come up with transportation dollars. Here's the story. So what's your opinion; increase taxes and improve roads or not? If you're headed toward Coeur d'Alene for your Sunday drive, you'll have to find a different route than I90 this weekend. I90 near Huetter between Post Falls and Coeur d’Alene is going to be closed for 10 to 15 minutes Sunday morning in both directions. The closure starts at 5:30 a.m. to allow for utility work by Kootenai Electric Cooperative. The City of Coeur d'Alene wants to remind you that you're responsible for keeping your sidewalk clear ALL YEAR ROUND, not just in the winter when it snows. The city has received a few complaints regarding sidewalks that are in need of basic sweeping. City street sweepers and flusher trucks are doing the roads, so do your part and take care of your sidewalk. Besides being a good citizen, do it because city code requires that abutting property owners keep sidewalks clear of dirt and other obstacles. This story isn't really about transportation, but it does involve bikes and conserving energy. Jones Soda Co. of Seattle took itself off the electricity grid for Earth Day, using cyclists to power lights, computers, printers and fax machines at its headquarters. Employees and others at the soda pop company began pedaling at 5 a.m. Wednesday, taking turns on nine stationary bikes hooked up to batteries to store the energy. I've been telling you for a while now that you can get a bus bench with your name, or your company's name, on it. Well, the program has had a lot of interest and we have about 20 organizations looking into getting bus benches already! The 'Benches for Bus Stops Committee' has signed agreements with six of those organizations and is working toward agreements with the others. This is pretty impressive considering that the original plan had been to only 'sell' 20-30 bus benches, and it's so early in the process! 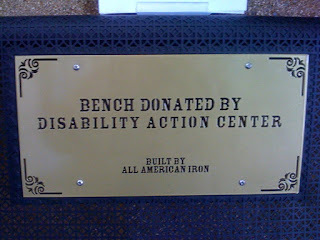 If you're interested in having your own bench at a Citylink stop, 5-year sponsorships are available to local businesses or individuals. 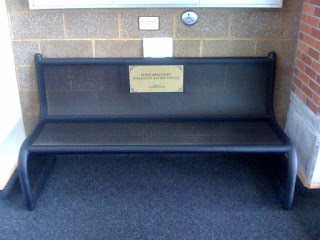 Advertising Sponsors will have their name engraved on a plaque on the bench back. If you're interested, give Craig Wilcox a call at (208) 818-2256 for further information. The vetoing continued yesterday for Idaho Gov. Butch Otter. He vetoed a total of 25 bills on Tuesday, after House overwhelmingly killed his transportation plan. Earlier in the day Otter had hinted that the vetoing would continue until his transportation bill was passed. It passed the senate early in the day, only to be killed by the House later. Here's the story. In the meantime, one of the bloggers on the Spokesman-Review's 'Huckleberries' blog did the math for his personal household and found that the tax Otter is proposing would add up to less than $5 a month for the two drivers in his home. The blog is taking an informal poll on how it would affect you. Voice your opinion here. Gov. Butch Otter is playing hardball now. He vetoed 10 bills yesterday, after threatening to veto key budget bills if the House and Senate didn’t pass a transportation funding increase by Wednesday night. The City of Coeur d'Alene still has free street trees for residents of eight new subdivisions. The trees are available for street-side planting in Canfield Park, Sunshine Meadows, The Landings, Ramsey Meadows, Copper Ridge, Jae's Place, Echo Glenn, and Prospector Ridge. Residents who are willing to provide care for street trees can contact the Urban Forestry division of the Coeur d'Alene Parks Department to sign up. Funding for the trees came from a street tree fee collected on residential building permits. The City is using forfeited funds to purchase trees and hire a crew to do the planting. The trees available are honeylocust, white ash, and black tupelo. It's 9 A.M. Do You Know Where Your Laptop Is? Here's a public service announcement from KMPO: if you have a laptop in the car, stow it on the front passenger seat or in the trunk. But not the backseat. A woman was killed recently by a laptop that hit her in the back of the head during a fender bender. Here's more. The fashionable thing to do right now is adopting babies from foreign countries, but I have a more affordable idea; how about adopting a Coeur d'Alene street? With spring here, Coeur d'Alene is once again looking for groups, families, citizens, etc. to take part in their Adopt-a-Street program. Here's how it works: you adopt a street and the City will provide signage, safety vests, and orange litter bags for you to keep that street free of litter and debris. The city will collect the bags the next working day after they have been filled. Adopt-a-Street volunteers are encouraged to pick up a minimum of twice per year, usually spring and fall. If you are interested in volunteering or would like more information, contact Diana Booth, City of CDA Street Maintenance Dept. at 208-769-2235. Well here's a new one. You've heard of bicycle messengers and bicyle commuters, but how about bicycle freight deliveries? That's what one couple are doing in downtown Portland, OR in an effort to reduce the amount of trucks on the road. 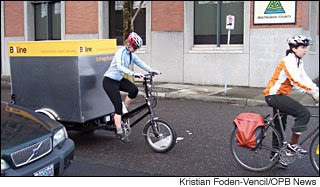 Here's the story on the freight-hauling bicycling couple. What's your opinion? Is this a good idea or not time and cost effective? An editorial in the Coeur d'Alene Press today criticizes the House for shooting down Gov. Otter's proposed 2 cent gas tax increase. The writer cites a dire need to raise money to improve transportation infrastructure. Here's the article. You use it, so help keep it clean too! The Centennial Trail Foundation is asking people to celebrate spring by pitching in to help prepare the trail for another great season of use. Volunteers will be picking up litter and installing signs this Saturday, April 18 with the help of Post Falls & Coeur d'Alene Parks Department and Kootenai County and Idaho Park & Recreation. Crews and volunteers will gather at 8 a.m. for words of encouragement, and coffee, juice, and pastries. Work should be wrapped up no later than noon. If you can help, please let Charlie Miller, Foundation Manager, know by calling(208) 292-1634. A reminder that the City of Coeur d'Alene is hosting a public workshop tonight regarding bike lanes on 15th Street. If you're interested in learning more about this project, or putting in your two cents, the workshop is at Fire Station 3 (1500 N. 15th St.) at 6:00 p.m.
Kootenai County's Bike To Work Week is getting geared up (get it- 'geared up??') to be bigger than ever. 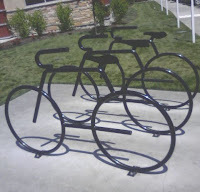 To start with, they have a new website up and running to let you know about all the Bike To Work Week events for 2009. And I have to admit, I like their tag line; 'Alright everyone....dust off your bikes, tune them up, and readjust your helmets after a long winter of sitting around getting chubby!' Apparently someone has been looking through my windows. Anyway, Bike To Work Week is May 11-16 this year, so check out this site for more info. The City of Coeur d'Alene will host a public workshop regarding bike lanes on 15th Street. If you're interested in learning more about this project, or putting in your two cents, the workshop is at Fire Station 3 (1500 N. 15th St.) on Tuesday, April 14th, at 6:00 p.m. Questions? Call Monte McCully, Trails Coordinator, at 292-5766. Practice your deep breathing folks, because the project to repave five miles of US 95 through Coeur d'Alene and Hayden starts this saturday night (April 12). The good news; most of the work will be done overnight to minimize delays to drivers. Crews will work Sunday through Thursday, from 7 p.m. to 6 a.m. It may be necessary to close one lane through the work zone area, but the contractor will leave one lane open for traffic at all times. The top layer of the old roadway surface will be removed and replaced with a new, curb-to-curb, full-width asphalt surface. The project also includes intersection upgrades, sidewalks, and new curb and gutter work. The intersection improvements may require closure of some intersections during work hours making detours necessary. Intersections will be reopened each day after 6 a.m. (during daylight hours). The Idaho House this morning has moved the subject of the $82 million GARVEE (Grant Anticipation Revenue Vehicles)bonding program to the top of its calendar. GARVEE bonds are a debt financing instrument that has a pledge of future Federal-aid and is authorized for Federal reimbursement of debt service and related financing costs. GARVEE bonds generate up-front capital for major highway projects that the state may be unable to construct in the near term using traditional pay-as-you-go funding approaches. “By the end of this construction season, 130 lane miles of road will have been improved with the aid of GARVEE,” Rep. George Eskridge, R-Dover, told the House. With inflation rates for construction materials, the projects will cost less if built with the bonds, Eskridge said, than if they were built years later when funding becomes available. Some lawmakers feel this could cause trouble in the future though, as it is essentially buying on credit. We'll follow this and update you. Looks like there won't be a gas tax increase any time soon in Idaho, the House voted 37-32 against Governor Otter's gas tax bill this morning. That could also mean there won't be a lot of road repairs anytime soon either. Here's the story. A motion from Sen. Shawn Keough, R-Sandpoint, to send $17 million in stimulus money to local highway districts just passed the Joint Finance-Appropriations Committee (JFAC) on an 11-9 vote. JFAC had been debating between three alternatives on how to distribute the money. The first would have the money distributed, whether to state or local roads, based on the greatest public safety needs. The second idea, from Keough and Rep. Jim Patrick, would give all the money to local highway districts, and the third would target the money on road maintenance, divided by formula between state and local roads. The nation's highways experienced the least amount of driving deaths last year since the year 1961! So why the decline in fatal accidents? Some say it's the economy forcing people to drive less, but this Spokesman-Review editorial contends it's something much simpler- seatbelt laws. Except for the rural route, ridership was up on all Citylink routes in March of this year, compared to the same time last year. Here's the latest ridership report. Due to substantial changes in the American Recovery and Reinvestment Act (ARRA), the Local Highway Technical Assistance Council (LHTAC) is opening a second application phase so all local highway jurisdictions that are eligible for the Rural Federal Aid Incentive Program will have an opportunity to apply for stimulus funds on the same footing. Initially, LHTAC elected to limit eligibility to those that had submitted projects under early versions of the federal stimulus bill. The final law provides more time to prepare projects for readiness and also covers preliminary engineering costs though, prompting the second application phase. Time is short to submit a second phase application. The due date is Wednesday, April 15, 2009 by 5 p.m.
Click here for more information and to obtain an application form. - Approximately $2 million dollars will be distributed in each ITD District. - Projects will be capped at $500,000. - Rating criteria are different than usual as the objectives are different. - Applications will be limited to one per Highway Jurisdiction. - Applicants will compete with others within the same district. - Applications will be sent to all rural highway jurisdictions that submitted stimulus projects. - All projects must comply with FHWA regulations. - Projects must be eligible under the current Surface Transportation Program. - Projects must be located on major collectors based on the most recent functional class map as approved by the Idaho Transportation Department. - Applications will be rated by the LHTAC Council. - The top two phase one applications in each district will be funded and programmed immediately. Second phase applications will be added to the unfunded first phase applications and the highest rated projects will be selected until funds are exhausted. - CMAQ and Enhancement projects are specifically not eligible under this program. It's not just Spokane using the photored cameras to catch red light runners, more and more communities are installing cameras to catch people speeding, committing acts of road rage, and running red lights. And more and more people are protesting the lights, sometimes resorting to vandalism. This story from the Wall Street Journal talks about some of the crazy ways people are fighting back (all of which we don't endorse here at KMPO). Drivers on U.S. 95, Idaho's primary north-south highway, will experience minor traffic delays starting next week during the resurfacing of White Bird Creek Bridge south of Grangeville. Work is expected to begin April 6 and go through May 15. The bridge deck will be removed and replaced to provide smoother travel and help protect the bridge deck. One side of the bridge will be closed 24-hours a day during construction. Flaggers will limit traffic to alternating one-way travel on the lane that remains open. The speed limit will be reduced to 45 mph for passenger vehicles and northbound commercial trucks in the work zone. Southbound trucks traveling down the White Bird grade will be limited to 25 mph. For safety, all trucks southbound on U.S. 95 will be diverted to a turnout near milepost 231 at the top of the White Bird grade. Truck drivers will be advised by a flagger of work taking place at the bottom of the 7 percent grade and of the 25 mph speed limit. Truck drivers should be prepared to stop at anytime on the downgrade. Kootenai County was hoping for more stimulus money than what actually came through, but that's pretty standard. Here's a recap from the Coeur d'Alene Press on what the area received as far as ARRA funds. At their regularly scheduled meeting today, the KMPO Board will consider the proposed design for a I90 interchange at Greensferry Road. Under the design alternative backed by several local agencies, it would be a full interchange with on- and off-ramps on both sides of the freeway, along with pedestrian facilities in both directions of an overpass or underpass on Greensferry. Here's more from the Coeur d'Alene Press. An editorial in the Spokesman-Review today supports Governor Butch Otter's transportation fund that the House killed, suggesting that Idaho lawmakers don't have a realistic grasp on what is needed to fix the state's roads. Here's the editorial. What's your opinion? How should idea road repairs be funded? All I Have To Say Is *&^%$#!!! 'Spring' snow is making a mess of local roads this morning. Rollovers and slide-offs are being reported all over the Spokane and Coeur d’Alene areas. Stevens (shown in the picture) and Snoqualie passes were both closed overnight, but open again this morning. Crews on Stevens had to clean up after an avalanche that hit a car but didn't hurt anyone and Snoqualmie was closed for avalanche control. Traction tires are advised on both passes if you're heading that way today or tomorrow. No studs though, as of Monday they're illegal until next year. I found this article from the Washington Post very intereting; the state of Virginia is taking a stand... against cul-de-sacs. From now, on all new subdivisions must have through streets linking them to neighboring subdivisions, schools, and shopping areas. This is being done in an effort to improve safety and accessibility, and has the bonus of reducing road maintenance costs for government agencies. Where Does Traction Sand Go In The Spring? 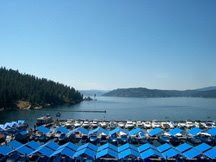 The City of Coeur d'Alene uses close to 1,000 tons of washed traction sand each winter. That's enough to make a nice beach in your yard for the summer. But once the snow and ice come off, you don't see that sand for long, so where does it just disapear to? The City of Coeur d'Alene's new blog has the answer to that.